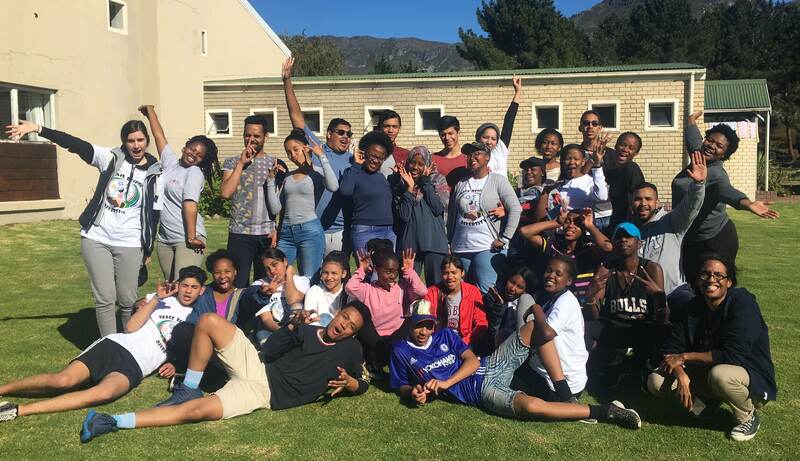 The weekend camp of the Marlene Silbert Youth Interfaith Intercultural Programme, took place at Mizpah, Grabouw Youth Camp Centre, over the weekend of 15th -17th September. 24 learners attended the camp. With the learners, we had a team of seven GOAL Facilitators, which was fantastic as the team worked well together, and were able to share responsibilities and be with the participants at all times. The aim of the camp was to bring the learners together, now towards the end of the year-long programme, to deepen their learning on the themes covered in the programme and think about how they are active citizens in their communities. This was done through fun games and activities that allowed the students to learn about creating trust, learn to work together, discuss issues of racism, gender discrimination, religion and xenophobia and develop a deeper sense of who they are in the world. Time was also allocated for the participants to design their community projects as well as to prepare their presentations for the Closing Function. The group came up with the idea of a pledge that they would like to share with the audience at the closing function, sharing what they have learnt and what they are taking forward from the programme. So overall the camp was a great success. The learners had fun and found the experience very meaningful. The accommodation and catering worked very well. And the facilitation team did an excellent job.